I was recently interviewed by Gabriel Moncayo, CEO of Always Hired and featured speaker at this year’s Return To Work You Love™ Conference. 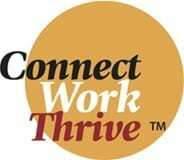 We discussed what we do at Connect•Work•Thrive, the reasons behind why I founded the company, and whom we help. I also spoke about our upcoming 12th Return To Work You Love Conference which will be held on October 10th in the San Francisco Bay Area. The conference is perfect for those who want to return to the workforce after a break from work, caring for children or parents, or maybe they’ve been in the same job for a long time and have now decided that they want a change of career. To learn more about our conference, visit our conference agenda and registration page.